When working with forest carbon stocks and emissions, it is notable that there is no strictly “true” data. In order to directly measure carbon in forests, one would need to cut the vegetation, dry it, weigh it, chip it up, and push it through a mass spectrometer. This being a self-defeating enterprise, scientists have for decades estimated carbon content of forests in the field using a mix of volumetric measurements (e.g. tree diameters and height), as well as allometric equations: mathematical relationships between tree volume parameters and carbon measurements collected from harvesting and weighing individual trees. With such equations, one can produce field estimated carbon stocks . However, the limits of measuring trees in the field are astronomical. In recent years, airborne LiDAR (light detection and ranging) has allowed scientists to produce similar (but not identical) volumetric measurements of forests from the air. But, LiDAR remains expensive to deploy. If high-resolution satellite imagery, such as Planet’s RapidEye or Dove data, could be used to sense the volumetric structure of forests, dramatic improvements in carbon mapping would be possible. The full paper is available via open access from the journal Forests. 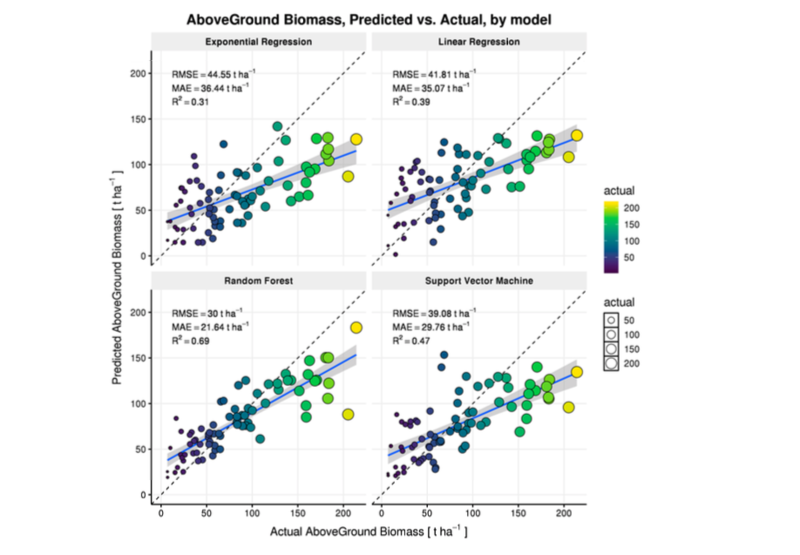 Lorena Hojas Gascón and her team used regression and machine learning approaches to link RapidEye-based estimates of forest biomass in Tanzania with field estimates. The RandomForest model performed the best, explaining 69% of variation in field estimated forest biomass.